14xx Class 0-4-2 Tank and Auto Coach featured here, were built quite a few years ago. They were built in a scale of 10mm : 1 foot , better known as , 1/32nd. or Gauge 1 and it was one of four loco and coach sets, built at that time. Three sets were sold to collectors, and I retained set number four. About six years ago, the owner of one of these models, unfortunately passed away, and as I was personally involved in the estate sale of his entire model collection, I purchased back his 1400 Autocoach set. It needed a new oak trim, and acrylic cover, but apart from that, it was in excellent condition. When a collector expressed an interest in purchasing it, I sold my set number four, with a view to restoring set number three with a new trim and case, for my own collection. However ... 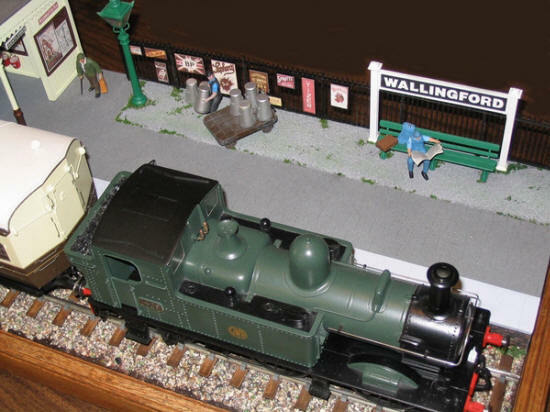 I decided to do something different with this last set, by adding a section of the Wallingford station platform to the model's base. A lot of time went into the research and building of this station building, but it was also a lot of fun too. Most of the information was acquired from the OPC publication "Great Western Branch Line Termini" Volume 1 .. by Paul Karau. The model is mounted on a turntable, allowing you to rotate it, for all round viewing. 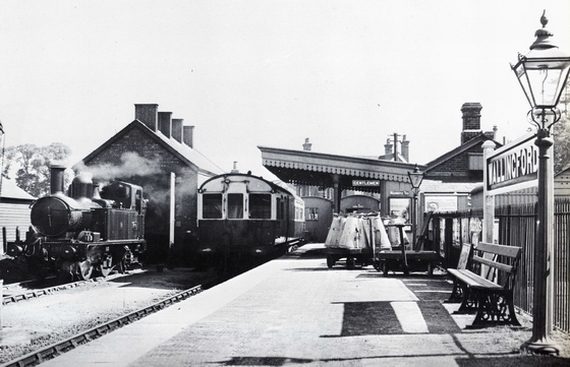 This is a picture, taken from the buffer stop end of the platform, showing the porter poised to give the driver his clearance to leave. 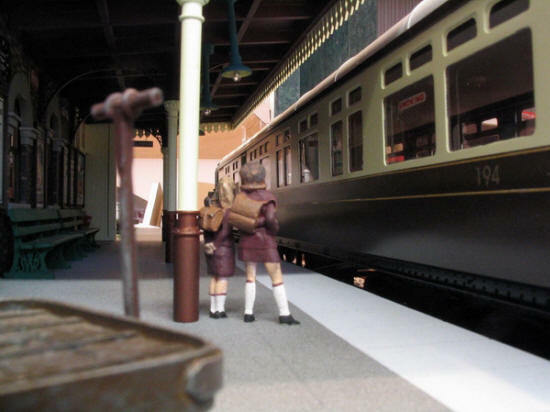 Another porter can be seen unloading a crate from the platform trolley, which like everything on this model, was totally hand built to the G.W.R. design of that era. Two school girls watch the activity down the platform. Under normal Autotrain practice, the end of the coach you can see in this image, becomes the front of the train on it's return journey. Single branch line operation like the Wallingford line, was a push-pull system. This train is shown standing at the buffer stop, ready to leave on it's journey to the other end of the line, and the driver would be in the locomotive with the fireman, for this trip. 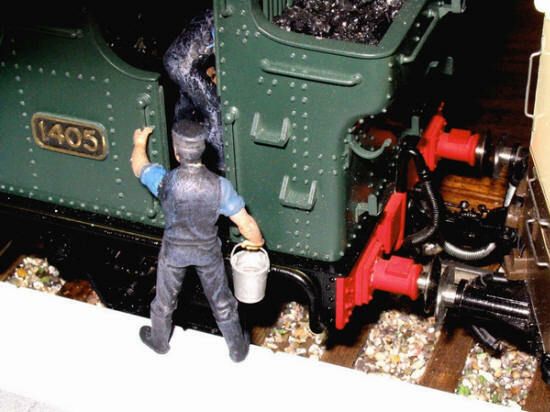 On the return journey, the fireman would stay in the locomotive, but the driver would come to this end of the coach, and could actually operate the steam regulator in the engine, at the back, from this position. The regulator lever can just be seen at the top left of the centre window, and this is connected by a series of square steel control rods, which run the full length of the coach to the loco. You can also see in the background of this picture, the walls of my den, where these pictures were taken. In some cases I have removed the background from the images, so as not to detract from the model, but in this case I decided to leave it in. 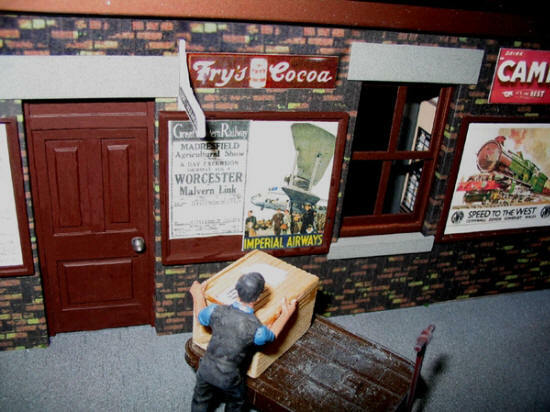 It seemed only fitting, that the photographs on the bookcase of my Mother and Father should be there, as they were the founders of this company so many year ago, and there major products at that time, were model railway building, for Bassett-Lowke Ltd.. The number of the auto coach 194 can be seen in this image also. This model of the trailer car, faithfully depicts car No. 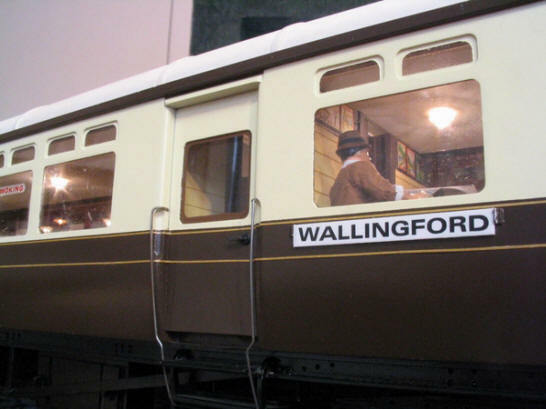 194, which was actually based at Wallingford, until about 1947. It is one of a series built by the G.W.R. at their Swindon works, to diagram A30, Lot 1480. A smart man, dressed in typical late 30's fashion, and obviously in no hurry to board the train. The timetable on the station building wall, is an actual copy of a Wallingford Branch timetable of that time, as are the other travel posters etc. depicted throughout the model. This picture, taken of course from the outside of the coach looking in, at the illuminated interior. You can see the natural wood walls, and the advertising posters on the upper part of the screen wall. Inside the cab of the locomotive, showing the fireman shoveling coal through the open firebox door. 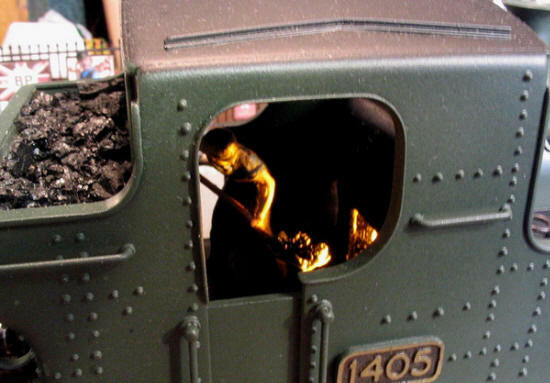 The warm glow from the illuminated inside of the firebox can be clearly seen in this picture. The real coal in the bunker was actually imported from Great Britain. Part of our model supplies brought with us when we came to Canada, but never the less .... actual English coal. An overview of the name board end of the platform, showing our serviceman passenger on the seat. The porter unloading the milk churns, and the old gentleman arriving, are also in good view. This image also gives you a great view of the top of the engine, and the rivet detail on it's side tanks. Incidentally, on these models, each one of those rivets were applied individually. They are not a rivet of course, they are very tiny domes, glued to the surface of the plexiglas side panels before painting. This same technique was used on the coach ends and buffer beams also. A close shot of the driver and engine rivet detail. This image also shows the couplings and brake vacuum pipe detail between the loco and coach. However, it does not show very clearly, the regulator coupling link that extend from under the two buffer beams of each vehicle. Unfortunately its being hidden by the two buffers in the foreground. 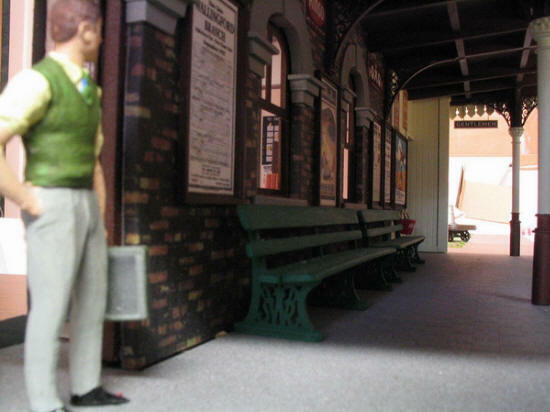 Looking down the platform with the station lights and the coach lights on, really gives you a sense of realism, and scale. I think taking photographs like these, at eye level is as much fun as building the model itself. A good picture of the simulated wrought iron scroll work on the canopy support brackets. This pattern is an authentic G.W.R. design, as are the support posts. The stonework over the windows simulates the actual architectural design on the Wallingford station building, taken from early photographs. The platform seats were cast iron frets, again, a G.W.R. design, with painted wood slats. and the model shows these in accurate detail. 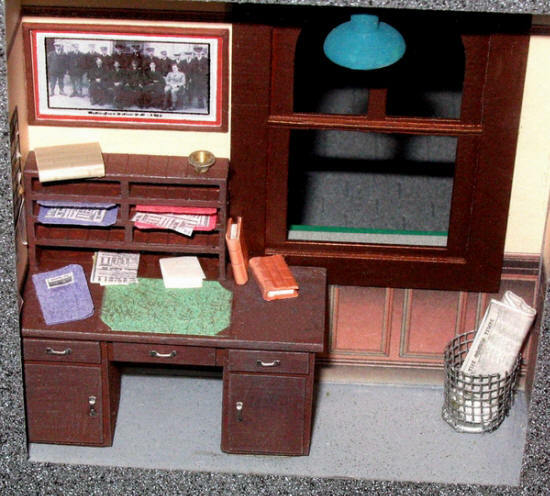 The Stationmaster's office shows a rather old looking desk and some untidy files. Of interest is the picture on the wall, which is a miniature copy of an actual photograph of the Wallingford station staff of that time. It surprised me that the staff was so large .... 16 of them ... for such a small station, but it does include engine drivers and fireman too. A discarded copy of the times is in the waste basket, and a bulletin board with all sorts of various notes can be seen almost out of camera on the left wall. 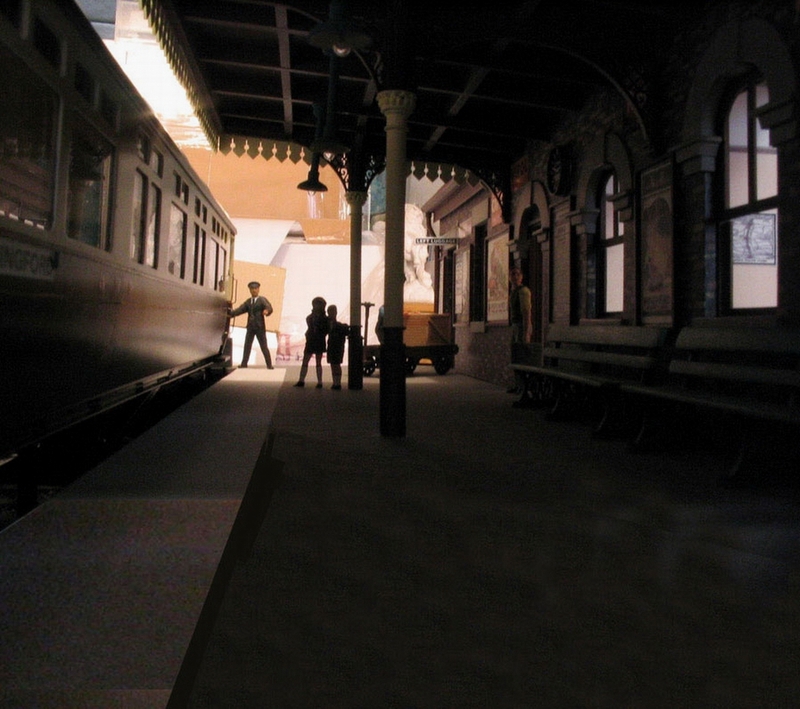 To have included the complete station building width in this model, would have made it too large, so I have just featured the first few feet of the station. 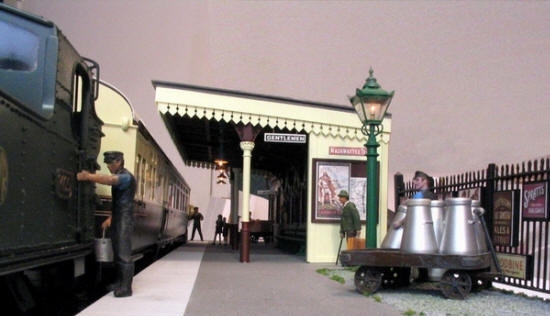 This picture shows the main building entrance to the platform, looking from the back of the model, out onto the platform, with the train in the background. 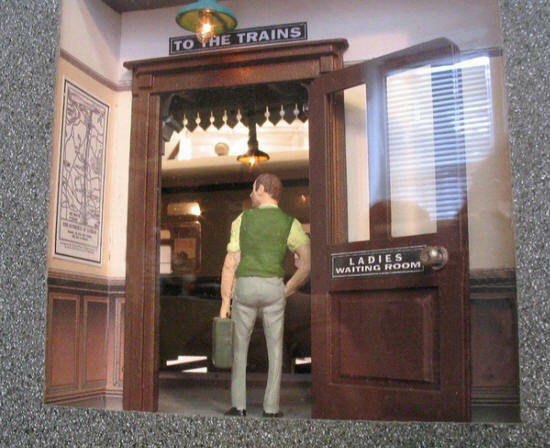 The ladies Waiting room sign on the door can be confusing, but when the door is in the closed position, it would indicate from the platform side, that the ladies waiting room was in the main building. This airman figure featured above brings back many memories to me personally. I've sat on many of these branch line stations myself, usually on L.M.S. lines, in my Royal Air Force days, back in the early 1950's. I just could not resist the opportunity to dress this guy up in his best blue uniform. A view from the outside entrance to the station, showing the wrought iron railings, with the metal enamel advertising signs. a common sight around that time. The station lamp also can be seen very clearly in this picture. Note the Wallingford station name, on the glass lens of the lamp standard .... not too easy to see! Wallingford Station on the 6th. June 1937 looking towards the buffer stop end of the platform. 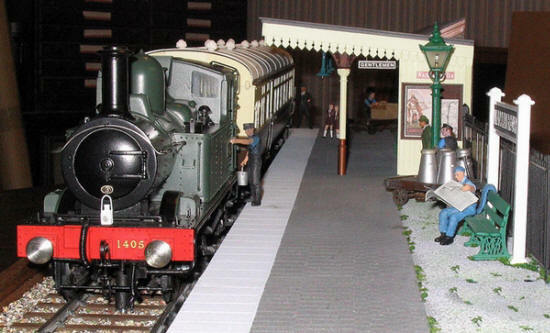 A predecessor of my 1400 Class 0-4-2 tank (#4862 Collett) stands in front of the single road engine shed, and an unknown auto coach stands at the platform. 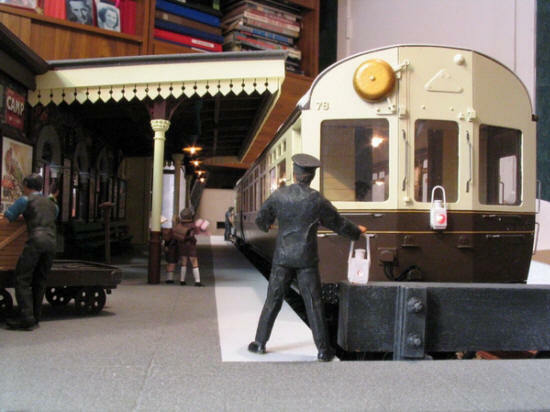 Picture taken from "Great Western Branch Line Termini" by Paul Karau. A great publication on early G.W.R practice. A view of the name board end of the platform, and also the front of our engine, showing the buffer beam and smoke box front. The white lamp on the engine also lights when the model is illuminated. What would normally be the shed number plate on the smoke box door, I have used as a model number. This is model number 3 of 4 of these engines built. 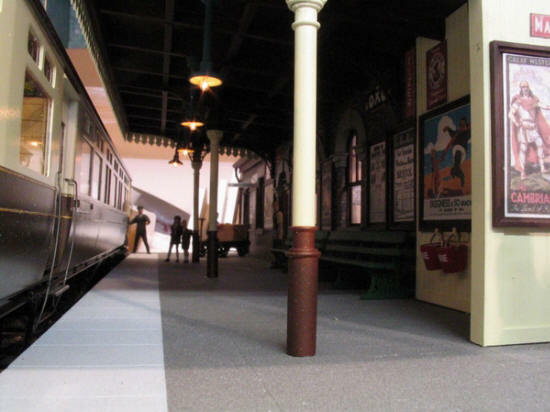 To see more of the 14xx locomotive, and more of the inside detail of the autocoach seating etc, visit the "G.W.R 14xx Auto Train" page. 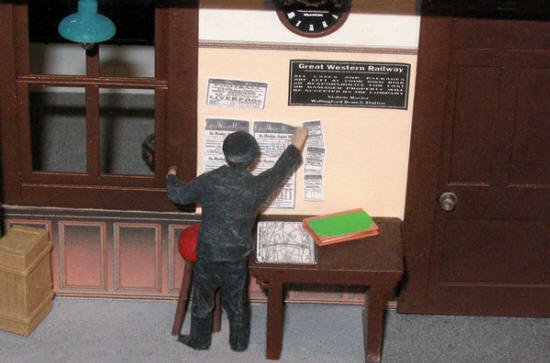 A closer look at the interior of the Left Luggage Office, at the end on the building, where a railway worker is featured posting the G.W.R timetable on the wall. Not very clearly shown, is the clock on the wall, which simulates the design of the special railway clocks of that time. 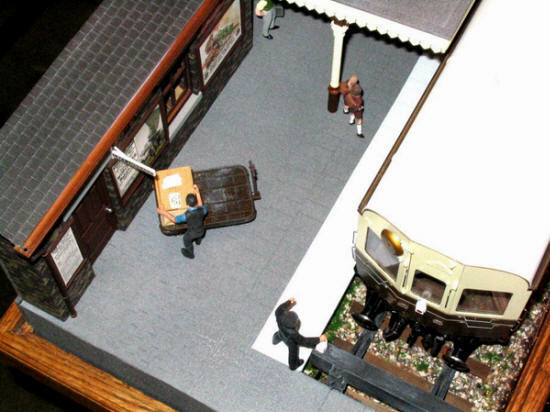 An overview of the buffer stop end of the platform, with an interesting view of the outside of the Left Luggage office, with the porter loading the crate. The simulated gray slate roof, rain gutters and down spout can also be seen in this picture. A close shot of the outside of the Left Luggage office, which shows the wall posters and advertisements in more detail. The notice board can also be seen on the inside of the office wall. 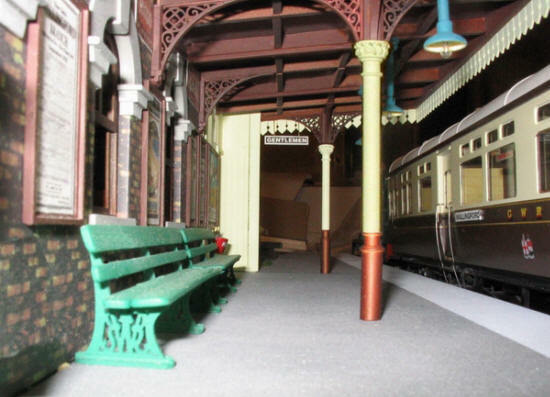 A view from the rear of the model, showing the four rooms of the station building. At the extreme left is the Ladies Waiting Room, with a passenger looking our of the window onto the platform. 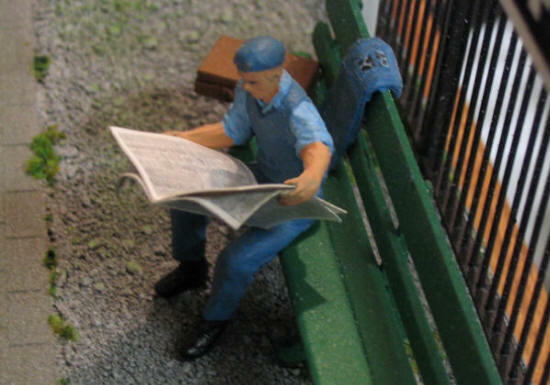 A discarded newspaper can also be seen on the wooden seating. 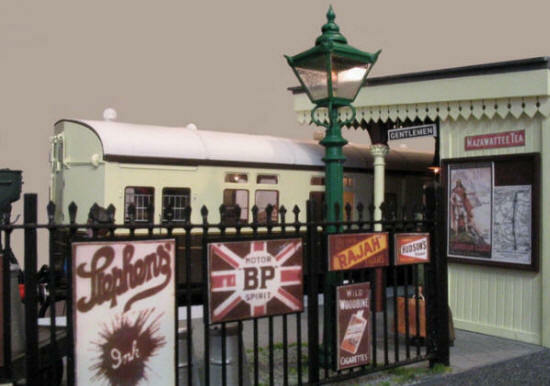 Next to that is the Stationmaster's office, then the main entrance lobby to the platform. On the right is the Left Luggage office. In the oak trim can be seen the small black push buttons for the lights. There is one at each corner of the model, and when held down .... the lights will come on. The model is also fitted with a manual turntable in the centre, which can be seen in this image. This allows one to very easily swing the model around to view it from any direction. One day I would like to build the street entrance side of the building and roof. Unfortunately I would have to sacrifice the view of the interior detail.